The citizen science movement is gaining momentum and both citizens and scientists can benefit. Citizen science projects allow students to participate in and contribute to real-world science while developing a stronger understanding of the nature of science. Citizen science is described as public participation in scientific research and is a way to involve ordinary people in real-life research with scientists. Scientists are increasingly realising the value of citizen scientists, as they can contribute data and many more hours of observations and analysis than scientists can achieve on their own. Citizen science also increases participants’ awareness and understanding of science and related issues. Citizen science is nothing new, but technology is now making it easier for school students to participate and access the results. How do citizen science projects work? Like any scientific work, citizen science projects have to be carefully planned to ensure the collection of meaningful and accurate data. People need to be adequately instructed or trained before taking part in such projects so they are aware of the scientific method that they are to use, and how to record their observations. This means that involving students in citizen science projects provides an authentic framework for teaching the nature of science and fostering your students’ science capabilities. 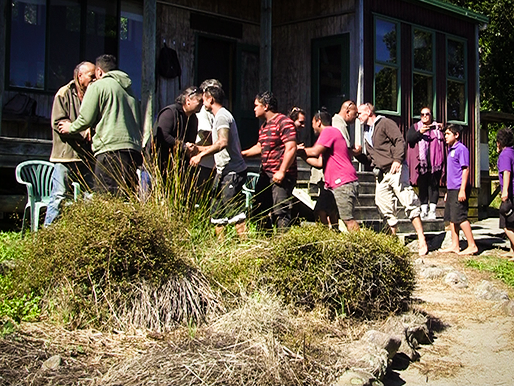 Recently, I organised a LEARNZ virtual field trip based on the New Zealand Garden Bird Survey. This field trip was an opportunity to explore a national citizen science project, encourage student participation in the project, and connect students with scientists. The garden bird survey asks people to record the highest number of each bird species seen in a particular area of their garden during a one-hour period. This information is useful, as birds are an indicator of the health of the environment. The survey is completed annually over one week and has now been running for ten years. Measuring the population trends of garden birds is an enormous task, hence the need for citizen scientists. 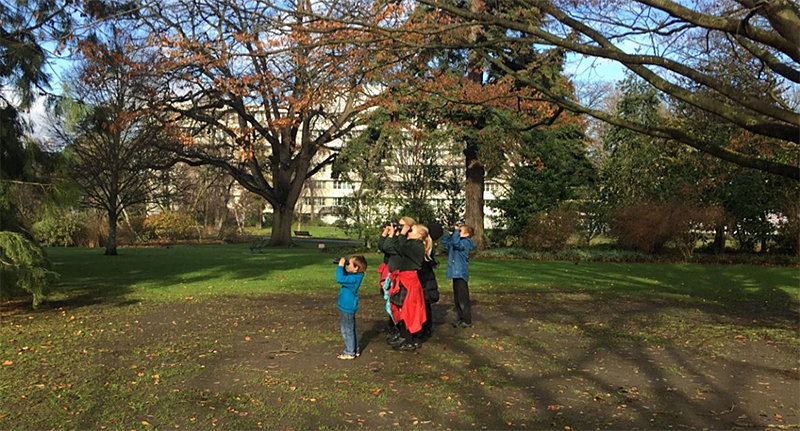 For students to effectively participate in citizen science projects they need to have adequate prior learning and support, so the LEARNZ Garden Bird Survey field trip was an ideal way to prepare students to take part in the survey. Along with the field trip, Landcare Research has provided a wealth of resources. All this online material provided students with the background needed to effectively participate and contribute as citizen scientists. The task could be altered to suit younger students. Rather than having to sit for an entire hour recording bird observations, students were encouraged to work collaboratively in 10-minute blocks and combine results. 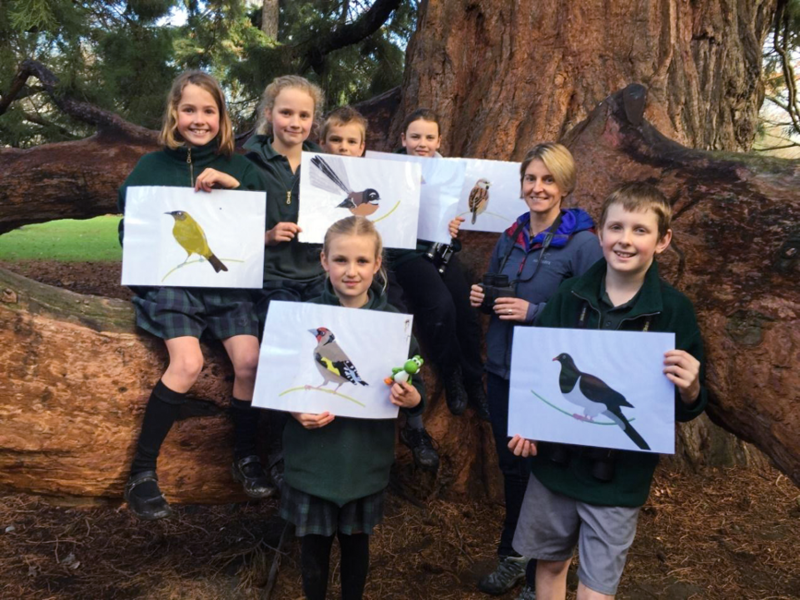 Springston School students share their bird identification skills during the LEARNZ Garden Bird Survey field trip. Initially, I was a little sceptical about how accurate some of the data recorded in the garden bird survey would be. During the field trip, I asked Jon Sullivan from Lincoln University about how accurate the results from the survey are. He assured me that inaccuracies in the data are taken into account through meticulous identification and analysis of variables. The sheer volume of data produced also means that averages and reliable trends can be determined. The field trip led to twice as many schools taking part in this year’s garden bird survey compared to last year. Students were able to connect with the scientists who helped create the survey during field trip audioconferences, and to compare their findings with those made by other students living in different parts of the country. A highlight of the field trip was seeing students actively engaged in meaningful science and sharing some of the inspiring work that schools such as Akaroa Area School are doing to restore local parks and gardens to attract more native birds to their local area. This citizen science project not only gave students the opportunity to learn more about birds and the nature of science, but it also allowed students to actively contribute to this science. Over the coming months, robust statistical analysis of the data will be completed, but already, students have been able to see a summary of the initial results online. The field trip allowed me to witness just how much awareness and satisfaction students can gain from taking part in a citizen science project. 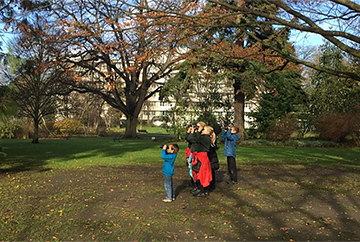 Students take part collaboratively in the New Zealand Garden Bird Survey. give adequate feedback to students by effectively sharing the analysis of results. Citizen science can expose students to real-world science and allow them to contribute to the body of scientific knowledge. These projects offer great opportunities to meaningfully develop your students’ science capabilities. Citizen science projects help students to understand the very nature of science. They foster curiosity, model sound scientific processes, and engage students not just in science but as scientists. Contribute to iNaturalistNZ NZ using the iNaturalist mobile App. This online community enables citizens to upload their own plant and animal observations, meet other nature watchers and learn about the natural world. I recently read a blog post by Wharehoka Wano and watched Alex Hotere-Barnes on EDtalks. Both of these discussions centred on Māori/Pākehā dynamics within education settings. Reading Wharehoka’s blog and listening to Alex got me thinking about an experience I had a few weeks ago when I was in Whakatāne as part of the LEARNZ Waka Voyaging virtual field trip. I don’t mind admitting that throughout the course of my life to date I have internalised some of those ‘white privilege’ examples that Wharehoka refers to in his blog. A lack of empathy and misunderstanding about Māori culture and its place in our society has surely led to a fair amount of ‘Pākehā paralysis’ on my part throughout my involvement in education. On the other hand, I did go to a primary school that had a lot of Māori culture within its curriculum. We learned many waiata along with their actions, how to pronounce words properly, some vocabulary and phrases, different games, as well as incorporating Māori culture and history into artwork and so on. Although this was now many years ago, I can certainly credit those formal experiences with grounding me enough to at least reflect on and question my own beliefs and assumptions around issues of ‘privilege’. What a pity this great start in Māori education didn’t extend beyond primary school! This is the third blog in this series on iNaturalistNZ (Blog 1: Contributing to your community as a non-scientist using iNaturalistNZ; Blog 2: Using iNaturalistNZ to build 21st Century Capabilities in Students). In this post I investigate how iNaturalistNZ can be used with specific Learning Areas of the New Zealand Curriculum. Just a reminder that iNaturalistNZ is predominantly a Science platform which helps build a community of citizen scientists who have the opportunity to interact with professional scientists. It also enables scientists to access reliable data collected by others that they can analyse. Results can inform people so they can take action. 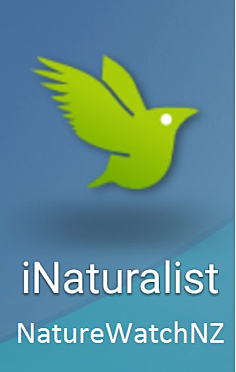 iNaturalistNZ utilises the free iNaturalist smartphone app for Android or Apple. 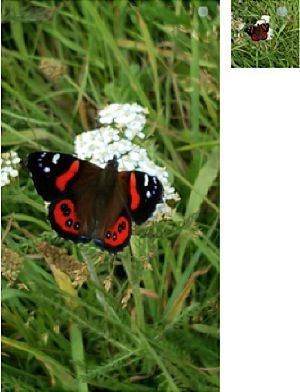 My observation of an endemic butterfly, the New Zealand Red Admiral or kahukura. As far as Learning Areas are concerned, iNaturalistNZ is squarely aimed at the Living World strand of the Science. But, I believe, it fits even more strongly with the overarching Nature of Science strand, and the more recently espoused Science Capabilities (more). 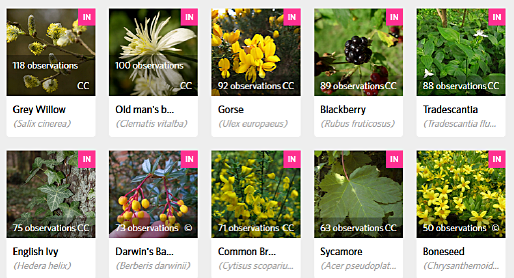 The data in iNaturalistNZ observations is open for anyone to analyse, so it cries out to be used in Mathematics and Statistics. Most people turn on GPS when they record their observations, so data has a location component, which also begs to be used in GIS (Geographic Information Systems) applications. GIS is a critical part of modern planning and design industries, with new jobs in GIS popping up everywhere in areas that most adults have never heard of. GIS is also a key aspect of Geography in secondary schools and in tertiary education. In relation to the Social Sciences, iNaturalistNZ can provide a place where students and whānau can “contribute to their local community”, and, at the same time, “engage critically with societal issues”. In my previous blog, I wrote about my largely personal reasons for getting involved in iNaturalistNZ (by downloading the iNaturalist app for Apple or Android). 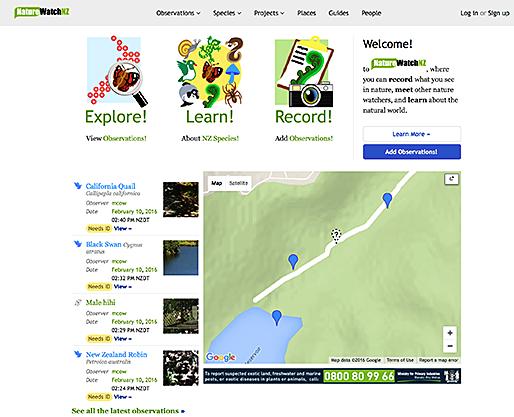 In this second post of this series, I look at reasons for educators to use iNaturalistNZ. 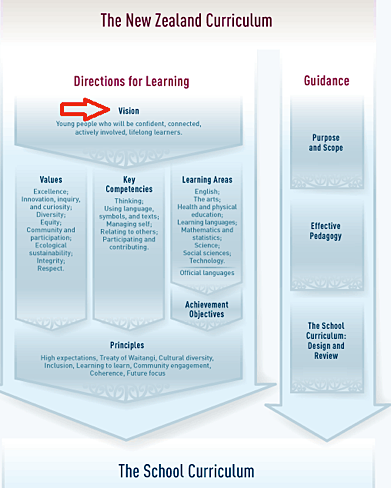 In doing so, I structure my arguments around the Vision for our young people, from the New Zealand Curriculum 2007 (NZC). Note: text below that is italicised denotes that it is quoted from the NZC. I also talk about the role of iNaturalistNZ as a digital technology for teaching and learning, and in building digital fluency, a key 21st Century concept. I point out where the role of the teacher is particularly important, and make suggestions to get you started with iNaturalistNZ at school. How could using iNaturalistNZ help? Our modern world is incredibly busy and complex. There are so many new things coming our way that we can’t take them all in, let alone act on them. However, every now and then we are exposed to something new, which turns on a whole lot of light bulbs at once. For me, it was being told about iNaturalistNZ, part of an international initiative called iNaturalist. In this blog, the first of a series, I will tell you about iNaturalistNZ and why it appeals to me as an educationalist, as a parent, and as someone simply interested in the Living World. I will also tell you about my journey so far with iNaturalistNZ, and hopefully tempt you to start using it too. My next blogs will look at the rationale for using iNaturalistNZ in formal education settings and delve deeper into iNaturalistNZ as a tool for learner agency in a globally connected world. iNaturalistNZ is a tool for all citizens that makes it easy for us to contribute to a living record of life in New Zealand. From the crowd-sourced data we create, scientists and environmental managers can monitor changes in biodiversity. iNaturalistNZ enables anyone with the iNaturalist smartphone app (Android or Apple) to record their observations of living things like plants, birds, and insects, and upload them to the Cloud so the iNaturalistNZ community can identify them and analyse them. It’s like iTunes in that the mobile app is used when you are out-and-about, whereas logging into your account from a bigger device like a laptop allows you to manage and organise your observations, and communicate with the iNaturalistNZ community.